"Chicken thighs marinated in a fragrant, crunchy peanut/ginger/honey/turmeric mixture, then baked. If you like chicken and peanuts as much as I do, you'll be wanting to have this every day!!!" 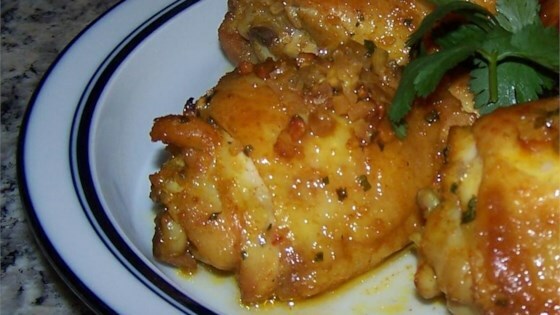 Place chicken thighs in a nonporous glass dish or bowl. Using your hands, cover chicken pieces with the peanut mixture, coating them completely. Cover dish and refrigerate to marinate overnight. Place chicken pieces in a lightly greased 9x13 inch baking dish; cover with aluminum foil and bake at 400 degrees F (200 degrees C) for 45 to 60 minutes or until juices run clear, turning every 15 minutes so that they cook evenly. Some of my family can't eat spicey-hot foods, so this recipe is ideal for them. I used boneless breasts and boneless thighs, so I reduced the heat to 350F, but still baked for 1 hour. This was ok. It was pretty bland. I would not make it again. The flavour was just not there. Next time we make this it will be modified to add some sriracha sauce for a little boost and some soy sauce. Love it! It very tasty and moist. My family told me to leave this recipe handy.